Not many are going to expect it but Shazam! is one of the super hero movies of the year. Beware the berated film studio! It is no secret that DC has been battered pillar to post over the past few years. It seems that movie goers and critics alike have loved to take DC to task over the fact that their films have been lesser than Marvel’s. In a way though it has been a crazy comment. DC’s animated films over the past few years have been amazing, Wonder Woman was a ground breaker when it came to the comic book movie genre and despite it not being everyone’s cup of tea even Aquaman was a film to be savoured. You just new though with those constant beratings though that DC were going to pull something very, very special out of their hats… what I’m sure of though is that not many people would have guessed that something special would be Shazam! From the trailers released Shazam! looked anything but the film I am about to rave about. The trailer suggested it would look like an awkward fit into the current DC universe – a film that in a way looked like a sad attempt at trying to cash in on the Deadpool market. The result is something very, very different though – the result is a film in which director David F. Sandberg (Lights Out, Annabelle: Creation) captures that 1980s childhood vibe of a film like Gremlins or Goonies and infuses it with just enough comedy and superhero storyline to make it work beautifully. The film starts off with a wizard named Shazam (Djimon Hounsou – Blood Diamond, Guardians Of The Galaxy) desperately trying to give his power to a new world saviour before he passes away. That task proves nearly impossible though as each of the people he tests end up giving up into the temptation provided by the seven deadly sins. As time goes on one of the young boys that he has tested grows up obsessed to prove that his brother and father were wrong about him making up the whole story about the Wizard and his realm. That boy has grown up to become the power-hungry and obsessive Dr. Thaddeus Sivana (Mark Strong – The Imitation Game, Kingsman: The Golden Circle) who is now determined to take all the power that he can find. Desperate to pass his power on and find someone to counteract the power of Sivana the Wizard eventually finds a young foster child named Billy Baston (Asher Angel – Driven To Dance, Andi Mack) who is so obsessed on finding his birth mother that he often turns his back on the families trying to help him. Now trying to settle in with his new foster parents, the kind Victor (Cooper Andrews – Den Of Thieves, The Walking Dead) and Rosa Vasquez (Marta Milans – No Tomorrow, Shame), Billy finds himself having to try and learn about the powers that happen when he turns into Shazam (Zachary Levi – Tangled, Thor: The Dark World) while trying to keep his new found identity secret from all but his super-hero obsessed co-foster ‘brother’ Freddy Freeman (Jack Dylan Grazer – It, Beautiful Boy). The thing that makes Shazam! such a great film is that Sandberg has tried to re-invent the wheel to much but at the same time as made the film so unique that it stands out from any of the other super-hero movies out there. At times you feel like you are watching a film like Monster Squad being directed by Kevin Smith. Together with his talented screenwriters Sandberg finds the right mix throughout the film – there are moments that are as dark as something like Harry Potter but then he will counteract that with some truly funny moments between Freddy and Shazam. Add those moments to the heartfelt storyline of Billy trying to find his family and you soon realise that this film has true heart as well as entertainment value. Shazam! also introduces the world to some young actors with big futures ahead of them. Asher Angel has the whole world on his shoulders as he basically has to try and carry this film. He puts in an amazing performance that is very reminiscent of the young Tobey Maguire playing Peter Parker and never seems daunted even when he has to do intimidating scenes alongside Mark Strong – who is in character actor heaven with his role. Alongside Angel both Jack Dylan Grazer and Faithe Herman (This Is Us, Doe) manage to steal some great screen-time… mark my words Grazer will be a star in his own right one day. Zachary Levi also does well to bring in a mix of comedy and action into the film and it will be very interesting if he one day has to act alongside the rest of the Justice League. Shazam! is one of the big surprises of 2019. You’d be lying if you said that after the watching the trailer you were expecting something great – but to be honest this is right up there with some of the best superhero movies. Funny when it needs to be, a film with true heart while not forgetting that a super-hero movie needs good action sequences Shazam! delivers all it needs to in bundles. 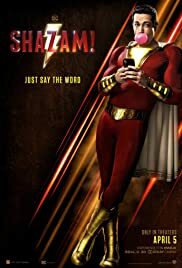 Director: David F. SandbergWriters: Henry GaydenStars: Zachary Levi, Djimon Hounsou, Michelle BorthSummary: We all have a superhero inside us, it just takes a bit of magic to bring it out. In Billy Batson's case, by shouting out one word - SHAZAM! - this streetwise fourteen-year-old foster kid can turn into the adult superhero Shazam.